There is a mindset that identifies violence with practicality. People who think this way regard boycotts, peaceful protests and civil disobedience of an oppressor as woolly-minded idealism, and assassination, terror and military force as hard-headed realism. They become impatient with negotiation and diplomacy when they fail to bring about immediate results, but believe in responding to the failures of military action with redoubled military action. I used to think a little bit that way myself. I of course admired Gandhi and Martin Luther King Jr., but I thought they were special cases because they appealed to humanitarian public opinion in the British and American democracies. To deal with a truly ruthless enemy, such as Hitler or Stalin, required armed force or even the threat of nuclear annihilation. 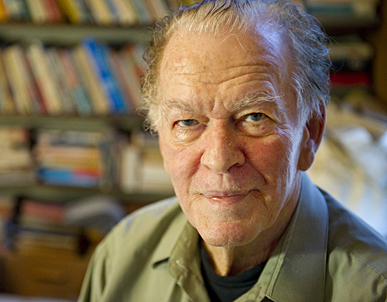 Gene Sharp wrote The Politics of Nonviolent Action in 1973 to challenge that kind of thinking. I never read it when it first came out. My interest was aroused when I learned that it was used as a tactical manual by Egyptian protesters who overthrew Hosni Mubarak’s dictatorship. Sharp contended that nonviolent action was as effective and realistic a means of struggle as war. He intended his book to inspire the study of nonviolent strategy and tactics what Clausewitz and other military thinkers did for the study war. The introduction was written by Thomas C. Schelling, a noted theorist of game theory and military strategy who was noted for his cold-blooded logic. He praised Sharp for his dispassionate and realistic approach. Sharp was to nonviolence was Clausewitz was to war. Like Clausewitz, he said strategy and tactics were aimed at the will of the opponent. Although Sharp was a conscientious objector, he insisted that you don’t have to be a religious pacifist to favor nonviolent struggle; there are many pragmatic reasons for doing so, he said. All oppressive institutions depend upon the obedience of the subjugated class; when that obedience is withdrawn, the oppressor is no longer powerful. And in Sharp’s view, the nonviolent fighter can win over or divide the opposition while a violent fighter unites it. Oppressive institutions fear nonviolent action more than violence, Sharp contended. That’s why agents provocateurs always try to instigate violence. Sharp said rulers prefer violent to nonviolent opponents because they know better how to deal with the former than the latter. If nonviolent resistance were weak and ineffectual, why wouldn’t the informers and infiltrators encourage it? 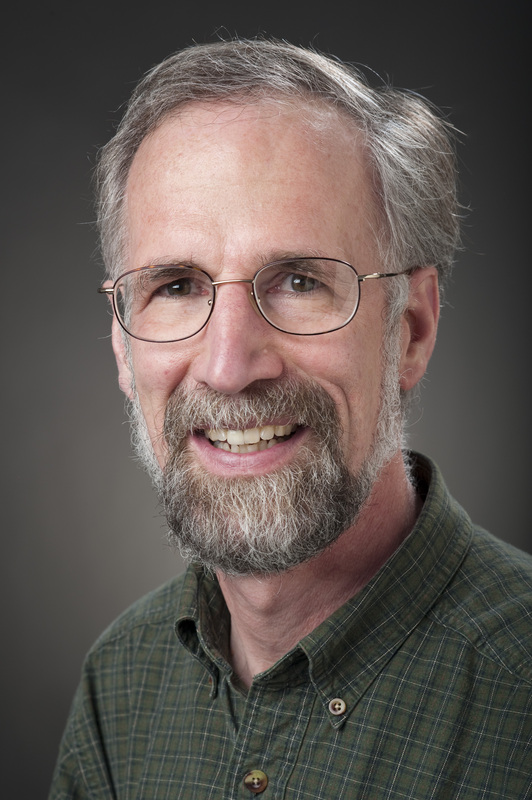 William Cronon is an outstanding historian on the faculty of the University of Wisconsin. I own two of his books, Changes in the Land: Indians, Colonists and the Ecology of New England, and Nature’s Metropolis: Chicago and the Great West. Both made me see the relation of history to geography and the natural world in a new way. Recently Prof. Cronon turned his attention to Wisconsin’s Governor Scott Walker and the Republican legislative program, and found some interesting things about where they’re coming from. Among other things, he found that the laws of Wisconsin are being drafted by an outfit called the American Legislative Exchange Council. I never heard of it before, but evidently it has been drafting model legislation for conservative legislators for 40 years, and claims a good success rate in getting its ideas enacted into law. Proposals such as Gov. Scott Walker’s union-busting law don’t come out of nowhere. They are part of a concerted nationwide effort. As Cronon emphasizes, there is nothing wrong with people banding together to advance a political program they believe in. The rise of the conservative movement in the United States in the past 50 years is a remarkable success story, and worthy of emulation by those of us who want to move the country in a different direction. At the same time, I wonder why I never heard of the American Legislative Exchange Council. Cornon posted his findings on his new web log. I won’t try to summarize his post. Click on Who’s Really Behind Recent Republican Legislation in Wisconsin and Elsewhere? (Hint: It Didn’t Start Here) to read it. I strongly recommend reading the post in its entirety. Wisconsin’s Republicans haven’t taken Cronon’s writings lightly. The Wisconsin Republican Party has used Wisconsin’s Open Records Law to subpoena any of Cronon’s messages on his university e-mail account that may relate to Republicans and politics; they won’t say why. Click on A Shabby Crusade in Wisconsin for the New York Times comment on this. As Dave Barry would say, I am not making this up. With nearly 14 million unemployed workers in America, many have gotten so desperate that they’re willing to work for free. While some businesses are wary of the legal risks and supervision such an arrangement might require, companies that have used free workers say it can pay off when done right. Some of these employers may be violating state and federal law, the Fortune article says. The U.S. Labor Department said it is stepping up enforcement of wages and hours laws. The federal Fair Labor Standards Act requires employers to pay minimum wage and overtime pay to all employees except interns, trainees and independent contractors. Under federal law, an internship must benefit the intern and must not displace an existing worker. An independent contractor can’t be under the control of a single employer or dependent on a single firm. The law exempts employers with revenues of under $500,000 a year unless they engage in interstate commerce. There also are “volunteers” who work for the “non-profit” sector. I have a friend, marginally employed with a patchwork of part-time jobs, who holds an unpaid volunteer position on a “non-profit” organization in the hope of bolstering his resume and eventually getting a paid job. I put “non-profit” in quotes because non-profit organizations can be highly lucrative for those in the top executive positions. Click on Unpaid jobs: The new normal? for the full Fortune article. Click on The Unpaid Intern: Legal Or Not for a report by Steven Greenhouse in the New York Times. Greenhouse is author of The Big Squeeze: Tough Times for the American Worker – an excellent book. Volunteer workers make an important contribution to society, and an internship, paid or not, can be a valuable learning experience. But the sharp increase in unpaid work reported in these two articles is something more than the desire to serve and the desire to learn. A commenter questioned whether the joke about The CEO, the Tea Partier and the union guy accurately described who’s getting the cookies. Well, there are plenty of cookies being baked, but the majority of working people aren’t getting them, and this includes government workers. Why isn’t inflation running hog-wild? During the 1970s we suffered a dramatic rise in inflation. Whip Inflation Now was President Ford’s response and Nixon had earlier ordered a freeze on price increases. I remember complaining to a local store that increased the price of Simlac, a baby milk formula. The result was they pulled Similac from their store and so I had to get the formula somewhere else where I didn’t know what the price was last week. At the time I remembered being told that this inflation was a result of Johnson not choosing between guns and butter. In other words we spent on defense and on discretionary items during the Vietnam War and that led to the inflation of the 70s. Doing both caused inflation. But the same conditions seemed to exist from 2001-2008 with little inflation. Now, I am hearing that inflation can be expected because there is too much money being created by the Fed. Too much money in the system. Yet, I thought classic inflation was caused by too much money chasing too few goods or because of the classic guns vs. butter cause. Are we really facing a time when we have too few goods available for us? The price increases in food and energy are not due to too little food or energy but multiple causes: speculation, droughts, increased industrialization in China and other former 3rd world countries. I struggled through Econ 101 and 102 and now I find a good indicator of why I struggled. Could someone smarter than me explain the seeming contradictions I have noted above? According to this, the hangover from the Vietnam war and the 1970s oil price shocks wouldn’t have caused inflation if the Federal Reserve System hadn’t increased the supply of money to accommodate the extra costs. If the money supply hadn’t expanded, then the Vietnam war spending and the oil price increases would have had to be offset by a fall in the price of something else or by the elimination of some product or service – which probably would have caused a recession. The amount of money in circulation is determined by the Federal Reserve Board. The Fed creates money out of thin air and puts it into circulation by buying government bonds; it contracts the money supply by selling bonds and making the money that’s paid for them disappear. Currency and coins are a small and important part of the money supply. By the end of the 1970s, inflation was so out of hand that the Federal Reserve Board decided to clamp down on the money supply, even though its members knew a recession would result. Throughout the tenures of Federal Reserve chairs Paul Volcker (1979-1987) and Alan Greenspan (1987-2006), the Fed gave priority to controlling inflation over promoting economic growth and creating jobs. Economic conditions made this easier than it might otherwise have been. 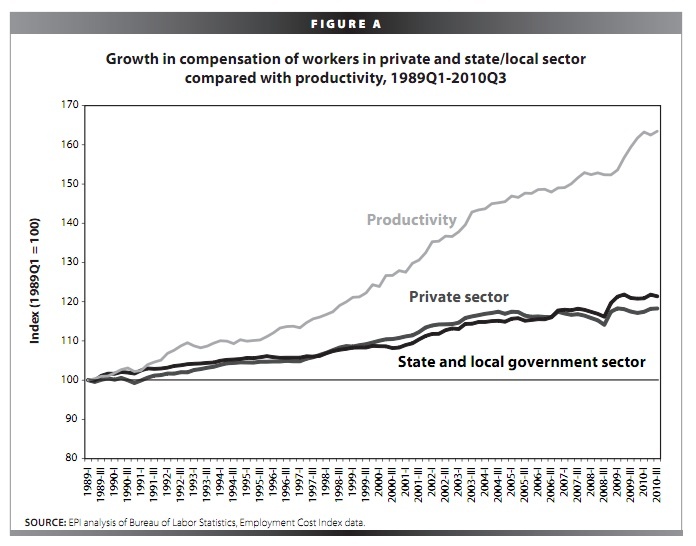 The weakening of organized labor eliminated the wage-price spiral of the 1950s and 1960s. Competition from overseas producers kept manufacturing wages and prices down, as did the shift from a goods-producing to services-producing economy. An unfavorable balance of trade normally would result in a depreciation of a nation’s currency and higher prices, but the U.S. has been shielded from this by the fact that the dollar is (so far) the world’s reserve currency. 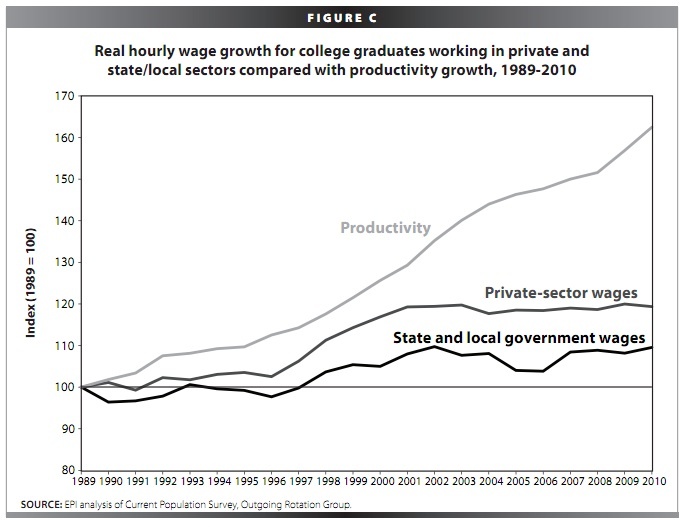 Stagnation in wages and job growth lessened both the push of costs and the pull of demand. But since the current recession began, the Federal Reserve Board under the leadership of chairman Ben Bernanke has been increasing the money supply in an effort to pump up the economy. The question is why this has neither increased inflation nor stimulated the economy. I think the reason is that for the money supply to affect the economy, it is not only necessary for the Fed to issue new money, but for the money to circulate. This doesn’t seem to be happening. Instead the newly-created money is being squirreled away by the big banks or used to pay down their debt. There’s another possible explanation, which is that inflation is actually more than the rise in the Consumer Price Index indicates. The method of calculating the CPI has been changed a number of times since 1982, all in the direction of making inflation seem less than before. Certainly the cost of food, gasoline and other necessities is up much more than 1.9 percent over last year. Click on How advertising creates intangible value for another Rory Sutherland video. Click on TED for more videos like this and background on the TED lectures. California, with nearly 33.9 million people, is about 69 times more populous than Alaska, with 493,782 people (according to the 2000 census). But they each have two Senators and the smaller states get extra representation in the Electoral College. 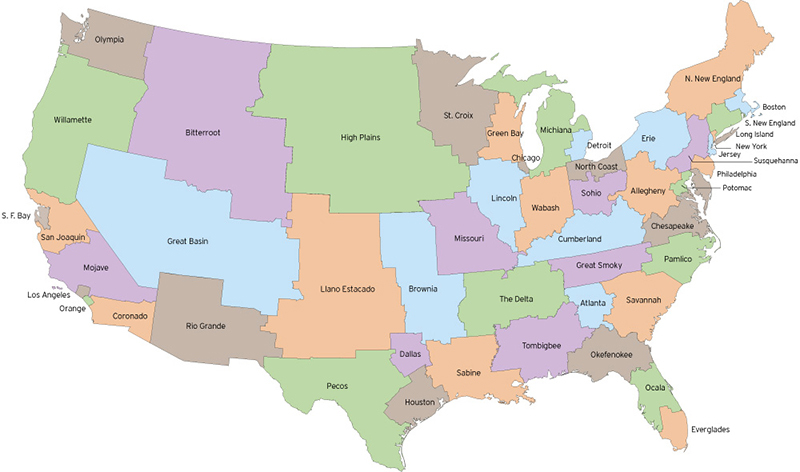 An artist and urban planner named Neil Freeman for fun redrew the state boundaries so they would have roughly equal populations of roughly 5.7 million people. Click on Electoral College Reform to get his thinking. There are two old sayings relevant to the U.S. intervention in Libya. Getting into is easier than getting out of. 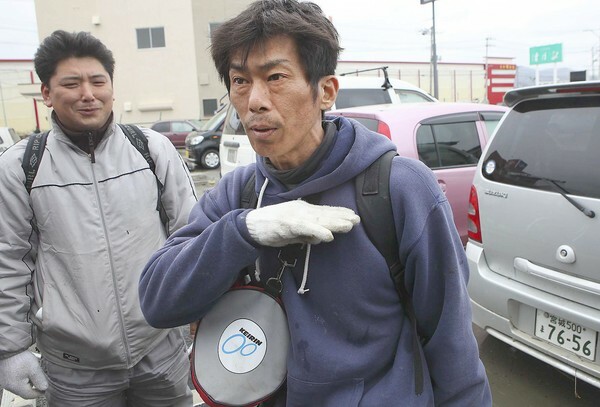 A Japanese man named Hideaki Akaiwa, whose wife and mother were missing in the earthquake and tsunami, found scuba gear somewhere, jumped into the tsunami and rescued them. Having shown it could be done, he then devoted himself to rescuing members of the public. Akaiwa said he was at work a few miles away when the tsunami hit, and he rushed back to find his neighborhood inundated with up to 10 feet of water. Not willing to wait until the government or any international organization did, or did not, arrive to rescue his wife of two decades — whom he had met while they were surfing in a local bay — Akaiwa got hold of some scuba gear. He then hit the water, wended his way through the debris and underwater hazards and managed to reach his house, from which he dragged his wife to safety. With his mother still unaccounted for several days later, Akaiwa stewed with frustration as he watched the water recede by only a foot or two. He repeatedly searched for her at City Hall and nearby evacuation centers. Finally, on Tuesday, he waded through neck-deep water, searching the neighborhood where she’d last been seen. He found her, he said, on the second floor of a flooded house where she’d been waiting for help for four days. Click on For one quake survivor, self-help in the face of seeming helplessness for the complete report in the Los Angeles Times. Click on Badass of the Week: Hideaki Akaiwa for an illustrated tribute to his heroism. Do labor unions have a right to exist? Freedom of contract begins where equality of bargaining power begins. ==Justice Oliver Wendell Holmes Jr. I get into arguments with people I know about whether labor unions ought to exist. Some have had bad experiences with labor unions – with unions that were too weak to do anything for their members, or unions that abused their power. Some say there once was a need for labor unions, but the need no longer exists because laws and government regulations will protect workers. I agree that unions and union members have done bad things, from the hard-hat construction union members who beat up anti-war demonstrators in the 1970s to the prison guards union which worked against legalization of medical marijuana in last year’s California referendum. But banks, the police and other institutions in society have abused their power, too, and no reasonable person proposes that they be abolished – only that they perform their proper duties. We take for granted that people who get income from investing their wealth have a right to unite into corporations and act as if they were a single person. But we don’t take for granted that people who get income from the labor of the hands and brains have a right to form unions and act in unity. And as for workers trusting government to protect their rights – laws are not self-enacting; neither are they self-enforcing. I have a legal right not to be forced to work overtime without pay. But as a lone individual, I lack the power to force a big business to respect that right, unless I have money to hire lawyers and time to wait – maybe years – for a decision. I recall an age discrimination lawsuit against Xerox Corp. which dragged on for years, and some of the plaintiffs died in the meantime. How the laws are written, and how much the regulators enforce them, depends upon the attitude of the party in power, and the attitude of the party in power depends on what social and economic institutions have the most influence. It is true that today’s labor unions are politically weak, but that his not an argument for making them weaker still. During the 1970s, 1980s and 1990s, I was a member of an extremely weak union, the Newspaper Guild. Each contract negotiation was about what we would give up, not what we would gain. But still – we had a contract. The company might impose its policy, but it was contractually obligated to follow that policy. There was something standing between the individual and absolute power. We weren’t subject to being fired because somebody took a personal dislike to any of us. I reported on business and the economy for the Democrat and Chronicle here in Rochester for 20 years. As things started to go bad in the local economy in the 1980s and worsened in the 1990s, I found a pervasive atmosphere of fear. Most people were afraid to say anything on the record that would be contrary to their employers – or potential employers. The only people who were unafraid to speak as free Americans were retirees, the self-employed (sometimes), tenured college professors and labor union members. These images of Saturn are not CGI (computer-generated images), but were assembled from thousands of still photos taken from the Cassini spacecraft. This makes the United States one of 30 countries to give birthright citizenship to children of non-citizen immigrants. In the U.S. case, citizenship has been given to children born in the United States to parents who are in the country illegally – which, however, has not prevented the deportation of the parents with their children. The purpose of the Fourteenth Amendment was to grant rights of citizenship to the newly-freed slaves, and to forestall any laws by the Southern white people to deny them citizenship. But when the amendment was being debated, its application to immigrants was discussed. The sponsors intended birthright citizenship for children of any immigrants who had settled permanently in the United States, but not for the children of diplomats and other temporary foreign residents, who were not subject to the jurisdiction of the United States. The first law restricting immigration was enacted in 1875, when a law was passed forbidding immigration of convicts and of Chinese contract laborers and prostitutes. There were no numerical restrictions on Latin American immigration until 1965. 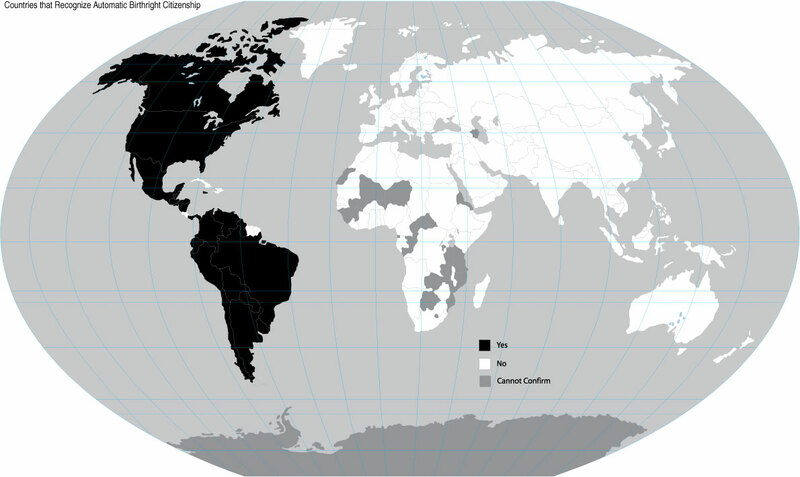 I don’t think it a coincidence that all the nations granting birthright citizenship (indicated in black on the map above) are in the Western Hemisphere. All these nations share a history of having vast lands and resources, a shortage of labor and a desire for immigration to alleviate that shortage. The constitutional question of whether birthright citizenship applies to children of illegal immigrants would seem to depend on whether the courts rule they are subject to the “jurisdiction” of the United States. It seems illogical that families who enter the United States in violation of its laws should have a right denied to those who obey our law, get in line and wait. At the same time the denial of birthright citizenship sometimes imposes cruel hardships. There are people born in the United States, who have known no other country besides the United States, in some cases honor students in high school or college, are subject to deportation to countries they have never known and to which they feel no allegiance. I don’t have a good overall answer to this within the framework of current law and enforcement, except to give judges latitude to decide questions according to individual circumstances. The law of birthright citizenship has to be a part of rethinking of our immigration system as a whole. Click on Birthright Citizenship in the United States: A Global Comparison for background information and the source of the map. The authors of the study state that the other 29 countries that offer birthright citizenship give it to children of illegal aliens, but I wonder whether this is true. Click on Birthright citizenship in the United States wiki for background information from Wikipedia. Click on List of United States immigration legislation wiki for Wikipedia’s chronological summary of U.S. immigration laws. Click on Jus Soli wiki for Wikipedia’s account of birthright citizenship internationally. I don’t see any good options on immigration policy. The least bad option is some sort of amnesty and path-to-citizenship program for the more than 10 million illegal migrants estimated to be in the United States, combined with some sort of guest worker program that would allow foreign migrant workers to enter the country temporarily. The amnesty is a bad option because periodic amnesties make a mockery of immigration laws. It is in practice not much different from no immigration restrictions at all. If an illegal migrant gets into the country somehow, all the person has to do is to escape detection until the next amnesty. A guest worker program is questionable because there is no guarantee against repetition of the abuses of guest worker programs in the past. The workers were at the mercy of their employers, much like the indentured servants in colonial times. An amnesty / guest worker program is, from my standpoint, bad politically because it drives a wedge into the liberal Democratic political coalition; it sets Hispanics against non-Hispanic blacks and whites, and immigrants against labor union members. However, it also splits the conservative Republican coalition between nativist anti-immigration militants and employers who want cheap labor. The argument is sometimes made that the illegal migrants are a net benefit to the United States, because they do work that citizens aren’t willing to do. Many of them work under conditions citizens wouldn’t be willing to accept, but that’s another matter. There are an estimated 11.2 million migrants in this country illegally, and at least some of them must be competing for jobs with the more than 13.6 million unemployed American citizens and legal migrants. An amnesty would be unfair to immigrants and would-be immigrants who have observed U.S. laws, and would see lawbreakers get in line ahead of them. Nor would it do away entirely with the problem of securing the borders. So long as there are any limits on immigration at all, there will be people who try to circumvent them. But even so, it is less bad than the other options, or so it seems to me. It is less bad than the status quo, which is to have a vast hidden underclass in this country, which is outside the protection of the laws and the Constitution. It is not just that members of this underclass are exploited themselves. 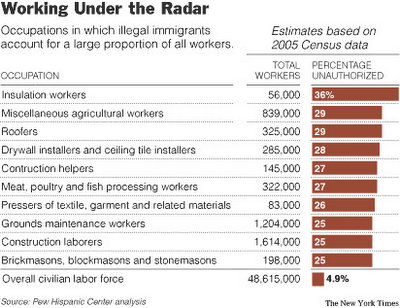 Their presence helps drive down wages and working conditions of citizens and legal immigrants. Bringing the migrants out of the shadows would give them the protection of American laws on wages and hours, worker health and safety and the right to organize in unions and bargain collectively. Bringing them within the law is in the common interest of citizens and migrants. And a guest worker program would allow the migrants to return home when the economy is bad without having to risk never being able to get back in. Remittances that migrants send back to Mexico are an important part of the Mexican economy. Aside from the sympathy we have for Mexicans as human beings, we U.S. citizens would not want to face the consequences of a Mexican economic collapse. I like the slogan, “A high fence and a wide gate” – meaning a generous program for admitting immigrants legally combined with strict enforcement of laws to keep the others out. The problem is the high fence. To root out and keep out illegal immigrants would require national laws much more draconian that the controversial Arizona state law. You could do it a biometric ID on file for every citizen and legal resident, and frequent checks to determine which individuals have a right to be in the United States. You would have to require employers to screen all job applicants, and hold them criminally responsible if they fail. You would have to greatly expand the Immigration and Naturalization Service – not a desirable way to reduce the national unemployment rate. This is not just a problem for the Southwest borderlands. Upstate New York has an important fruit and vegetable industry that depends on low-wage illegal migrants – or that is what I perceive from the outcries of growers every time the INS raids one of their camps. The Border Patrol operates freely in Buffalo and Rochester, which are within 60 miles of the U.S. border; they can be found in the bus terminals, checking the ID of any foreign-looking person who gets off the bus. There is a detention center in Genesee County near the New York Thruway and distant from everything else. I can see why, given the requirement to enforce existing laws, these things are done, but it smacks of a police state more than I like. I can see how someone might find my thoughts overly sentimental. 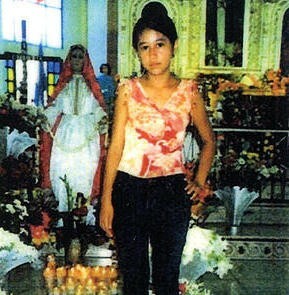 In an earlier post, I reviewed the book, The Death of Josseline, whose title refers to the death of a 14-year-old girl crossing the border from Sonora into Arizona. But after all, the hundreds of thousands of migrants who cross the border every year might find a few hundred deaths an acceptable risk. And many 14-year-old girls have died in Iraq and Afghanistan as a byproduct of American efforts to achieve national objectives there. You could do a cost-benefit analysis – the death of X number of migrants versus reducing their number by Y thousands. The ultimate solution to the immigration problem would be a high-wage, full-employment economy, in which the laws on wages, hours, health, safety and the right to bargain collectively are enforced, and sound economic development in Mexico and Central America, so that people in that part of the world could earn living wages where they are. I don’t think these goals are impossible, but I don’t think they will be achieved anytime soon. On Saturday night the full moon was bigger and brighter than it has been in 18 years, and I didn’t even notice. 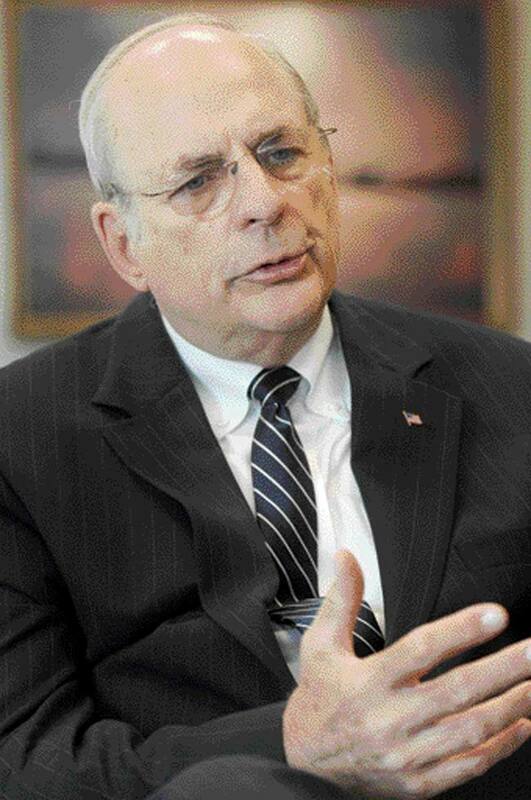 Norman Augustine was an aerospace businessman who served as Undersecretary of the Army from 1975 to 1977, and was CEO of Martin Marietta Corp. from 1987 to 1995 and CEO of Lockheed Martin Corp. from 1995 to 1997. He wrote the satirical Augustine’s Laws, with pseudo-technical commentary and charts, in 1983. Augustine’s 1st law. The best way to make a silk purse out of a sow’s ear is to start with a silk sow. Augustine’s 2nd law. If today were half as good as tomorrow is supposed to be, it probably would be twice as good as yesterday was. Augustine’s 3rd law. There are no lazy veteran lion hunters. Augustine’s 12th law. It costs a lot to build bad products. Augustine’s 13th law. There are many highly successful businesses in the United States. There are many highly-paid executives. The policy is not to intermingle the two. Augustine’s 15th law. The last 10 percent of performance generates one-third of the cost and two-thirds of the problems. Augustine’s 16th law. 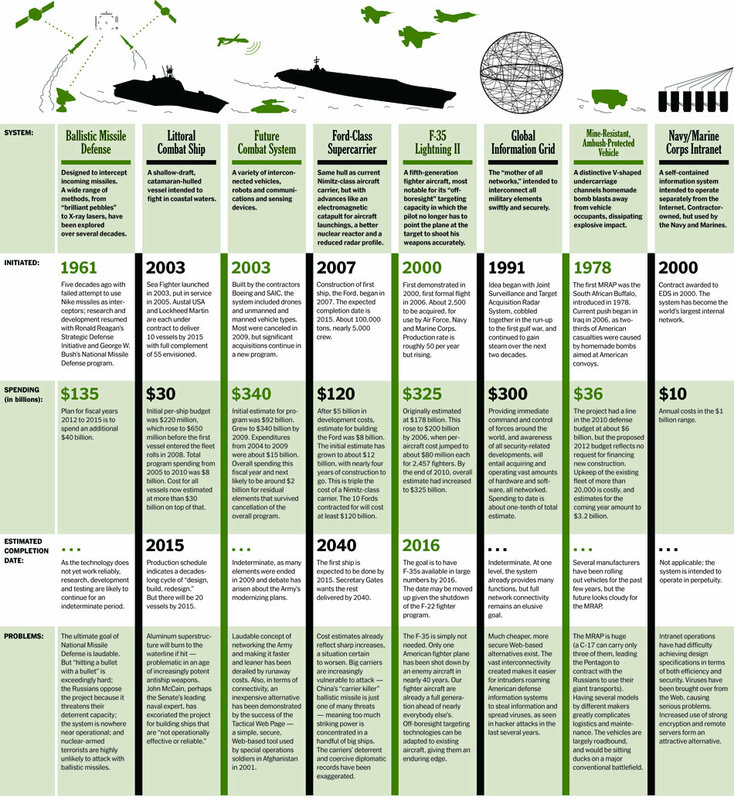 Defense budgets grow linearly but the cost of military aircraft grows exponentially. Corollary: By 2054, the entire U.S. defense budget will purchase one aircraft. It will be shared by the Air Force and the Navy 3 1/2 days each week, except in leap years, when it will be made available to the Marines for the extra day. When do we believe the experts? Barring real evidence of systematic bias or incompetence, I’m willing to accept the consensus view of specialists in most fields. … … So here’s my question … : Why don’t we accord the same level of deference to economists? Shouldn’t the pro-free trade consensus within the field of economics be as bullet-proof as belief in global warming? It’s not a partisan issue – in my opinion, the best introduction to the benefits of international trade was written by Paul Krugman. And the strength of the pro-free trade consensus in economics is at least as robust as the consensus view among climatologists. There are a few high profile dissenters, but those exist in every field, including climatology. via The League of Ordinary Gentlemen. Some 20 years ago, I had doubts as to whether global warming was real, and I thought the North American Free Trade Agreement was a good idea. I changed my mind in both cases because of the evidence. All of the predictions in regard to global warming have come true. None of the predictions of the benefits of the free trade agreements have come true. I write “free trade agreements” instead of “free trade” to sidestep the question of whether the pure theory of free trade has ever been implemented in practice. 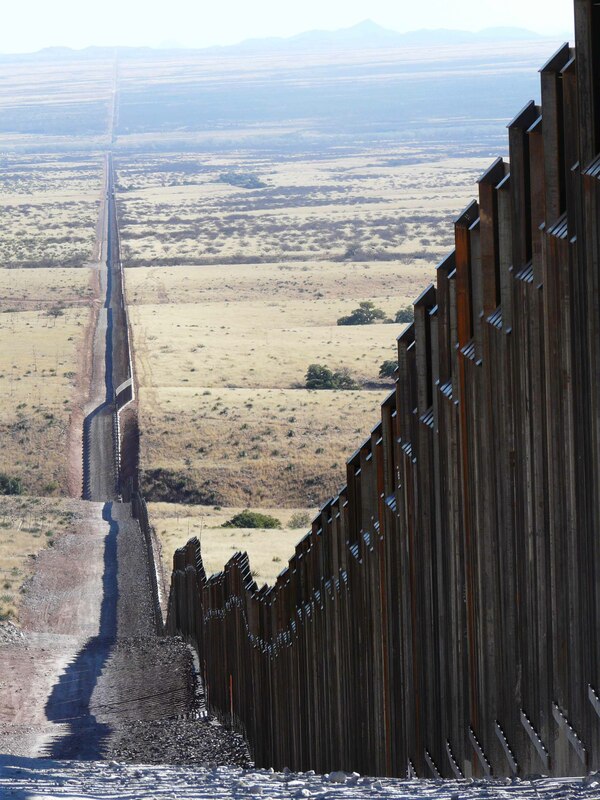 During the mid-1990s, the Border Patrol attempted to deal with illegal immigration by sealing off the crossings opposite San Diego, El Paso and the other cities along the Mexican border. Officials of the Clinton administration figured that the problem was solved because no sane person would brave the Sonora-Arizona desert with its murderous heat and lack of water. They were tragically wrong. Hundreds of people die in the desert each year, but they continue to cross, in search of a better life and the means to feed their families. 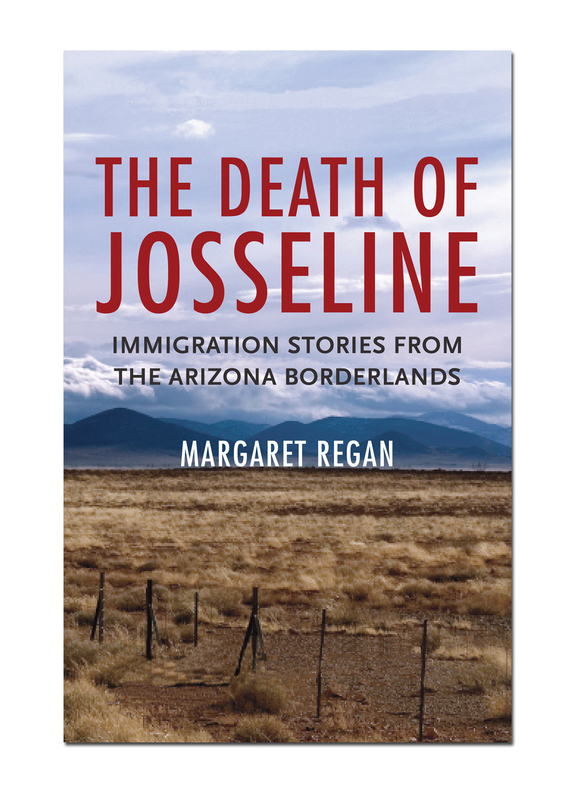 Margaret Regan, a reporter based in Tucson, wrote The Death of Josseline: Immigration Stories from the Arizona Borderlands as a connected series of stories about deaths, near deaths and rescue attempts of migrants in the desert, but touching on all aspects of the border situation. She did not directly advocate a policy, but her accumulation of human stories has a powerful and mind-changing impact. The stories that touched me the most were several different incidents when illegal migrants summoned the Border Patrol for help when one of their party was sick or injured, sacrificing their own chances of entering the United States even when the other person was a stranger. The book’s title is based on the story of Josseline Hernandez, a 14-year-old girl from El Salvador, who crossed the border with her 9-year-old brother. Her mother worked illegally in California and her father in Maryland at low-wage jobs; she lived with relatives until her parents saved enough money to pay for her trip north with trusted friends. Josseline knew nothing of what to expect or how to dress for the desert, which can be freezing cold (as it was then) or unbearably hot. When she became sick and couldn’t keep up, the “coyote” (guide) went on without her. He told her the Border Patrol would be sure to rescue her. This didn’t happen. Weeks later her body was found by a member of No More Deaths, one of the volunteer organizations that sets out water and food along the likely migrant trails. 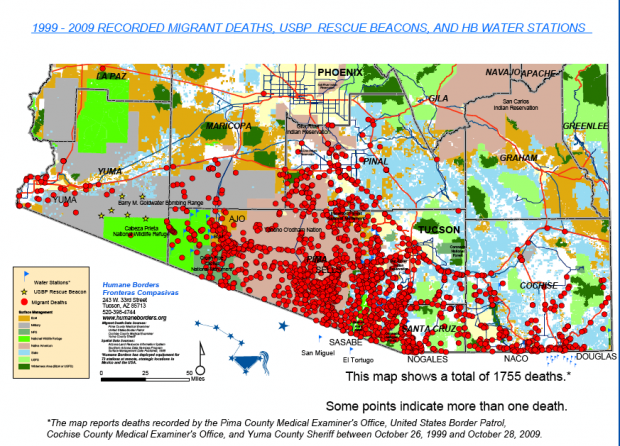 No More Deaths reports that 1,755 bodies were found along the Arizona border over a 10-year period, and more than 5,000 along the U.S. southwest border as a whole over a 15-year period. This is a count of bodies, not deaths; nobody knows how many bodies were never found. Josseline’s mother couldn’t accept the fact her daughter was dead, and an unscrupulous coyote claimed to know of her whereabouts, which he would disclose, for a fee. Only after a DNA test did she give up hope. Why would loving parents subject their daughter to such risk? Regan did not describe the individual circumstances of Josseline’s parents, but it is hard to survive economically in El Salvador or any of the other countries that are sources of migrants. These countries suffer not only from internal conflicts, but from the influx of subsidized U.S. grain, which has wiped out small farmers in the region. Free trade agreements with the United States were supposed to make it possible for Mexico and Central America to create export industries that would employ their people, but this didn’t happen. If the United States had a guest worker program, under which Josseline’s parents could have entered the United States legally on temporary visas, they could have gone back for their daughter. But with the closed border, illegal migrants don’t dare leave because they might not get back. I was struck by how many of Regan’s stories were about migrants were from El Salvador, Guatemala and other central American countries rather than Mexico itself. There must be some sort of known system, maybe even an underground railroad, for getting past guards on Mexico’s southern border, traversing Mexico’s 2,000 miles from south to north, crossing the U.S. border and then traveling within the United States to their destination. As a friend of mine said, this is a whole shadow world that is all around us, and which affects our lives, but of which we are unaware. Much of the book is about the impact of the reverse Berlin Wall the United States has built along its southern border. I was tempted to write that the East Germans were more successful at keeping people in than we Americans are at keeping people out. 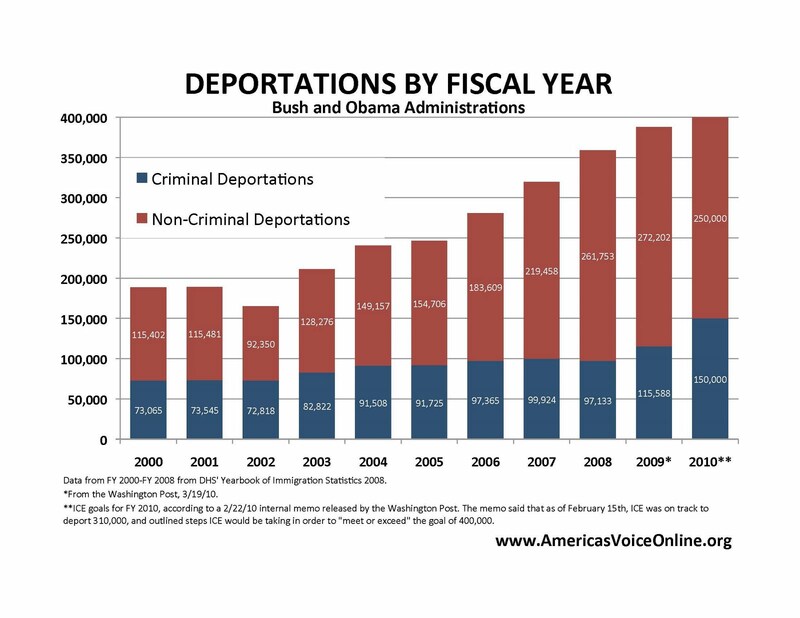 But the volume of illegal immigration has declined during the past decade, and the estimated number of illegal immigrants present in the United States also has fallen a little in the past couple of years. 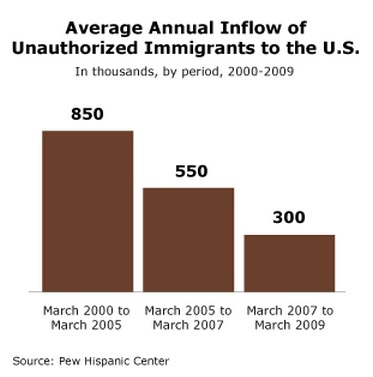 Perhaps there are economic factors, but stepped-up border enforcement must have an effect. Regan interviewed many resident Arizonans with a roughly equal dislike for the illegal immigrants, who trespass on their property, leave litter and trash, and sometimes commit vandalism and theft, and the Border Patrol, which also has little regard for property rights. This includes residents of the Tohono O’odham Nation, whose Indian reservation touches on a big segment of the border. She stuck strictly to facts, and did not overtly propose any policy. She did an outstanding job of being fair to all points of view, including the Minute Men border vigilantes, who are shown performing individual acts of kindness to people in distress. I have a certain sympathy for the Minute Men. I think there is an upper limit to how many immigrants a nation can absorb and still preserve its social and economic fabric. The question that Margaret Regan forces me to confront is: How many 14-year-old girls am I willing to see die in a futile attempt to enforce that limit? Click on U.S.-Mexico Border Crossing Deaths Are a Humanitarian Crisis for a summary of a 2009 American Civil Liberties Union report. 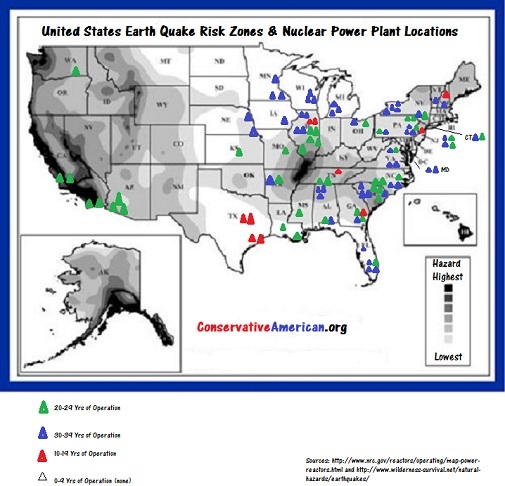 I’m not an opponent of nuclear power in general, but Japan’s experience should show that nuclear power plants in earthquake zones are a really bad idea. Click on Could It Happen Here? for the original map in context. A Wall Street money manager named Barry Ritholtz wrote a good article in the Washington Post about the IBGYBG management philosophy of so many Wall Street banking and brokerage firms. I do not care what shareholders and their boards pay the people who create enormous value. … … On the other hand, many others received huge bonuses for bankrupting their firms and driving the economy into recession. Their job performance should be the subject of your ire and of regulators. They brought the world to the abyss of economic collapse because they had incentives to do so. – Subprime mortgage brokers who were paid based on the quantity – not the quality – of their mortgage writing. The loans lenders sold to Wall Street to be securitized carried a 90-day warranty. Hence, the brokers’ jobs were to find people who would make the first three monthly payments of a 30-year loan. After that, it was no longer their concern. – Collateralized debt obligation managers whose job it was to assemble pools of mortgages, yet had little or no understanding of the underlying loans. The salespeople, traders and managers working in the mortgage sector had incentives that were upside down. The greater the risk they took, the more they were paid. But brunt of those risks was on third parties, never themselves. It was shareholders and taxpayers who shouldered them. This is backward. The people who should bear the downside are the ones who have the upside. Instead, the system was perversely one of private profit but public risk. l Lehman Brothers Chairman and CEO Richard Fuld Jr. made nearly a half-billion – $490 million – from selling Lehman stock in the years before it filed for Chapter 11 bankruptcy. l Countrywide Financial (now owned by Bank of America) founder and CEO Angelo Mozilo cashed in $122 million in stock options in 2007. His total take is estimated at more than $400 million dollars. l Stanley O’Neal, who steered Merrill Lynch into financial collapse before it was taken over in a shotgun wedding with Bank of America in 2008, was given a package of $160 million when he retired. l Fannie Mae CEO Daniel Mudd received $11.6 million in 2007. His counterpart at Freddie Mac, Richard Syron, brought in $18 million. In 2008, the two were forced into government conservatorship. As Ritholtz pointed out, things weren’t always this way. Once most Wall Street firms were partnerships, and the partners went into personal bankruptcy when their firms failed. Their mansions, yachts, automobiles and even their watches were auctioned off. During the 1970s and 1980s, the big partnerships became public corporations, and the principle of limited liability meant that the owners were only on the hook for what they put into the firms, not for what they took out of them. It’s not practical to turn the Wall Street firms back into partnerships. Instead Rithholtz suggests legislation to make corporate executive personally responsible for reckless management and to claw back their excessive compensation. I think that’s an interesting idea. A better idea, in my opinion, would be to make the corporate decision-makers criminally liable for criminal actions of a corporation. A blogger named Alex Knapp asked a good question. We live in a country where Creationists can run for President without being laughed out of the room, homeopathy is seen as real medicine, millions of people buy into “The Secret” that wishing for something hard enough makes it real, and the cast of the Jersey Shore is rich. Until that changes, I find it hard to believe that we’ll be able to improve education outcomes significantly no matter how radically we reform the education system. Kids aren’t dumb. Why bother to acquire knowledge when it’s manifestly unimportant to do so in our culture? Improving education: What really works? Parenting is more important than teaching in how well children do in school and in life, according to a researcher named James J. Heckman. He wrote a research paper saying that the best way to help poor children is to get parents into voluntary programs that help children acquire life skills at a very young age. A strategy that places greater emphasis on parenting resources directed to the early years is a strategy that prevents rather than remediates problems. It supplements families and makes them active participants in the process of child development. Remediation strategies as currently implemented are much less effective. This is the flip side of the argument for early intervention. Many skills that are malleable in the early years are much less so in the teenage years. 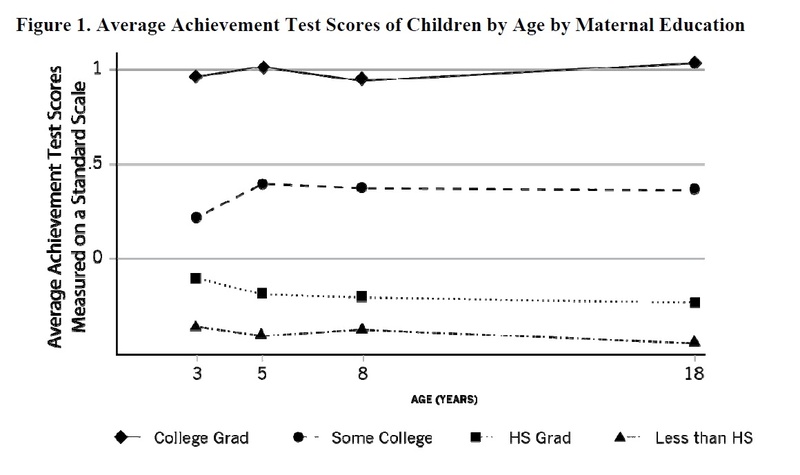 As a consequence, remediating academic and social deficits in the teenage years is much more costly….For high quality early childhood interventions, there are none of the trade-offs between equity and efficiency that plague most public policies. Early interventions produce broadly based benefits and reduce social and economic inequality. At the same time they promote productivity and economic efficiency. They are both fair and efficient. Heckman cited something called the Perry preschool program, which targeted poor, low IQ African-American preschoolers in a city outside Detroit. The children were taught to plan, executive and evaluate projects on a daily basis. They were taught social skills. The program staff visited and advised parents on how to help their children do better. Because the children were reached early in life, when their minds and attitudes were malleable, the program’s benefits carried on through life – much more so that programs aimed to teenagers or young adults. 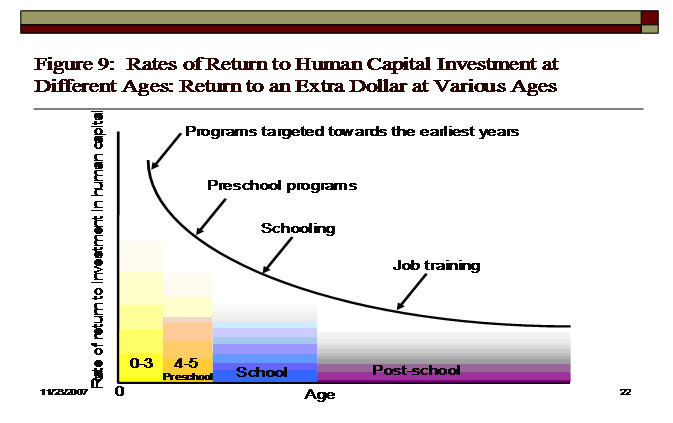 Heckman pointed out that while there have been successful programs of early childhood intervention, there is a lot to be learned about what works and what doesn’t. He said it is important that the programs be voluntary and that different things be tried. He would like to see non-profit private foundations engaged in experimentation. (The implication I draw is that they should do this rather than pushing pre-conceived ideas, but he doesn’t actually say this).